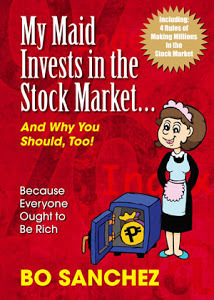 Philippine Stock Market Is Falling, Dont Panic...Still The "BESTEST" Time To Get In! Two days later. It happened. How's that? We're now at 5738.06 level. But like we always say, we really don't care. We at the Truly Rich Club are standing in the shoulder of giants anyways. We'll keep Investing until we reach there. I remember what bro. Bo Sanchez had said in his newsletter for the Truly Rich Club members (and still non-members)... "Now Is The “BESTEST” Time To Get In". Really. This is the best time to get in, take advantage of this down market. "Philippine stocks tumbled for a second day, sending the benchmark index to the lowest level in eight months, amid concern that capital outflows will accelerate. The peso fell to the lowest level in almost three years. 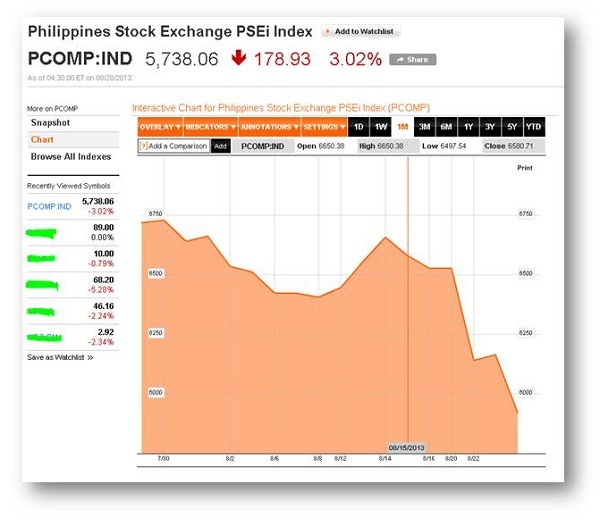 The Philippine Stock Exchange Index (PCOMP) dropped 3 percent to 5,738.06 at the close in Manila. The gauge earlier slumped as much as 6 percent to its lowest intraday level since Nov. 26. SM Investments Corp. (SM), owner of the largest shopping-mall operator and biggest grocery chain, slid 7.5 percent to the lowest since October. Ayala Land Inc. (ALI), the nation’s biggest builder, sank 4.7 percent to the lowest level since December. We don't panic, we just keep on doing what is supposed to be done on this market. I few hours ago, I received this newsletter from Bro Bo. This is strictly to all members only, but since I love you, as my avid reader (I am referring to this Truly Rich Club review blog site subscribers..Thanks you). I'm NOT sighing because of what’s happening to the Stock Market. longer they stay down, the better it is for you. is in panic mode. She feels that she'll lose all her money in the Stocks. She said she’s pulling out all her money now…"
the Stock Market -- whether in TRC or not -- just tell them to chill. Relax. There's nothing wrong with their investments! Keep buying Stocks, future multimillionaire!